This discovery came about through a 'catch all' advert for tethered cars and associated material by a member of the Retro Racing Club. One reply led to a car that could be considered to be amongst the most desirable of items to find. Not only was it an exceedingly rare example of the make, but was possibly unique in terms of British tethered car history for a variety of reasons. Of course, no one knew any of this at the time of its purchase. What was known was that it was quite large, was powered by what purported to be a 25cc hydroplane engine, which is how we initially became involved, and that the asking price was sufficiently high to make this, as yet unidentified car, a questionable purchase. 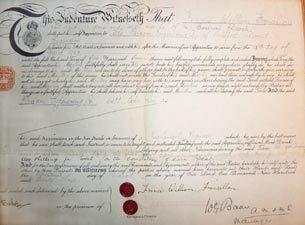 Following much deliberation and discussion the decision was made to buy it in March 2008, although it was realised that it was something of a gamble. The photos from the owner showed a motor that looked suspiciously like it had originated from Hallam and that the car had more than a passing Dooling influence and included some Dooling parts. After delivery and some more detailed photos, its identity was revealed in double quick time. As soon as Peter Hill saw the car he recognised it as a FRC, made in Swindon, Wiltshire. Coincidently, he also had a number of original prints from a past member of the North Wilts Model Car Club, which showed others of the same make with the same distinctive radiator casting. What the prints also showed was that with the exception of this feature, they were all significantly different to the car that had turned up. There was something strange here that needed further investigation, but in the meantime it was back to the ‘mystery motor’. What was clear was that it was not a large hydro motor, and from the various features that it definitely was a Hallam, but not one in any of the usual reference books. It was not a ‘Hallam 10’ as it had conventional mounting lugs. It looked similar to a Series III Nipper in many respects, but was too big, as a vernier dropped down the plug hole confirmed. The only clue was a note that the Nipper Series III had been produced in a larger version called the Super Nine. Here we were stuck until the late Mike Beech came to the rescue. Mike was incredibly knowledgeable about the products of the company from Poole and recognised the motor as a Super Nine, which was only produced for about a year around 1947, and only available as a factory produced unit. This was somewhat unusual, as much of Hallam’s production was castings and kits for home building. Ironically, this is one aspect of the identification process that could have been cut short. A subsequent investigation of the motor when it was removed from the chassis and cleaned up revealed 'Hallam–Poole' on the front cover and 'Super Nine' and the serial number '4732' on the rear cover. Always easy to be wise after the event! This then left the matter of the car. There was no doubt that it was a FRC, but why was it so different to the versions in Peter’s photos? This was the start of what turned out to be a long an illuminating period of research for OTW. 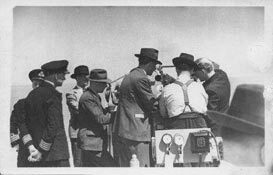 'Model Cars' is always a good starting point and the issue for July 1947 provided a possible explanation. 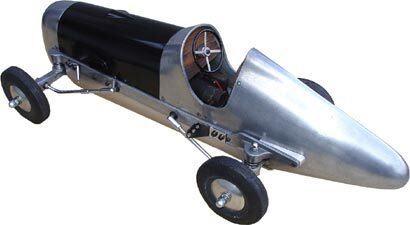 ‘Simple Simon’ in his ‘Trends of the Trade’ feature announced that the first model race car in kit form for the English market ‘has now made its bow’. The makers were F.R.C Miniatures of 124 Victoria Road Swindon, and the man behind the venture, Mr F.W. Francillon. The photographs show the bare chassis, presumably held by Mr Francillon, and a three quarter view of the complete car. The author states, " Considerable time, thought and hard work would seem to have gone to planning of the FRC model, the prototype of which is seen in the accompanying illustrations. He describes it as the ‘first off’ and that its appearance ‘somewhat resembles one of those Brooklands cars of the outer circuit days.’ It goes on to say that later versions have a modified tail based on a grand prix Maserati. The next issue of 'Model Cars' mentions the FRC again, but this time with a photograph that showed the bottom of the car and Mr Francillon wielding a screwdriver on the cockpit area. These articles explain the difference in looks between the cars, but closer examination of the photos revealed even more features that were present on the existing car, but not on the production versions. From details of the castings, transmission and axles it was clear that the car that had been bought was what was illustrated and described in Model Cars as the prototype FRC, an incredibly exciting discovery. Why then was the car so similar in design to a Dooling and using Dooling parts, and how did it come into being? The answer lies in Francillon’s wartime experiences. 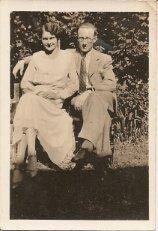 Francis William (Bill) Francillon was born at Weymouth Dorset in 1908, although the family lived at West Allington, part of Bridport, just to the west of Weymouth. It was something of a tradition in the family that the name Francis was used regularly for the first-born child, including the girls, although with the es ending. His father was Francis Arthur Francillon, a marine engineer, later to become a master mariner. Following a spell at Dorchester Grammar School, Francis William, aged 14, started a five year apprenticeship at Paragon Engineering of Bridport in 1923, training to be a mechanical engineer. By the early 1930s he was working in the aviation industry, which took him to London where he married Gwendoline Wade in 1933. Their daughter Frances was born in 1935 although she was more commonly known by her second name, Jeanne. The family were living in Surbiton through to the outbreak of the Second War, which saw Francillon working as a government officer on behalf of the Admiralty. 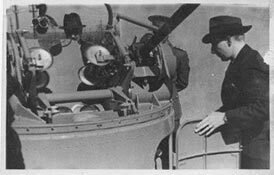 This was primarily providing mountings and gun turrets for fast patrol boats, through a company called Marine Mountings Ltd. The company was based at Yate near Bristol until Feb 1941 when the factory was bombed and relocated to Orkus Road in Swindon. A fellow worker at the Swindon factory tells how Marine Mountings were building turrets for Oerlikan guns. Certainly, Francillon was based in Swindon by this time, probably moving there when the factory relocated. In September 1941 Francillon left Liverpool on the SS Edam for a 17 day crossing to the United States. 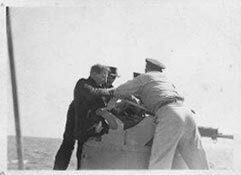 Photographs taken during his trip show him supervising the installation of gun turrets on American PT boats in New York. 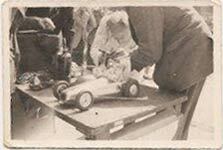 Tethered car racing had continued unabated throughout the States during the war and according to an interview some ten years later, it was during his visit there that he was first introduced to model car racing. He was later to recall that is was then when "the bug caught him, and his wife has been sorry ever since". 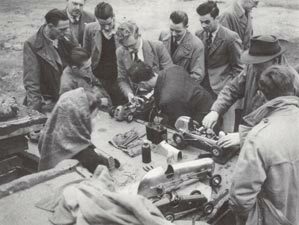 Francillon returned to Britain in May 1942 with a selection of Dooling parts and the intention of building his own tethered racing car. 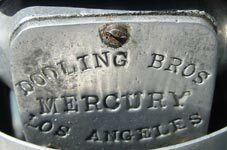 The car that would eventually become the FRC was largely complete by 1943 and based very closely on the Dooling Mercury Deluxe, and if the body is ignored could easily be mistaken for a Dooling product. The car was built round a cast aluminium X braced chassis with twin, pivoted axles with eccentric adjusters at the front and bevel gearbox axle at the rear. 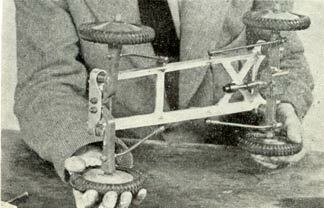 Axles were located with adjustable radius rods and suspension via four coil springs between spigotted pads. 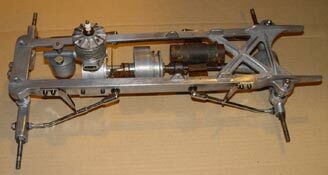 The front axles have pivots adjustable via eccentric pins and were Dooling items, as was the rear axle and gearbox unit. The chassis is slightly wider and less sharply tapered than the Dooling equivalent but does not have mounting lugs for the radius rods. Lugs were cast on to the top of the chassis for mounting the separate body sections. The body was the most amazing piece of work and a tribute to the skills of the pattern makers and foundry men. The nose, scuttle and tail were all cast in aluminium and fit exactly, with no machining. The two mounting blocks for the tail are even more complex, being tapered in two directions and curved on one of the tapered sides. A rolled steel bonnet completed the bodywork. The photos of the ‘prototype’ in Model Cars raise several questions. The illustration shows the car without a motor and no ignition or fuel systems. There also seems to be no facility for mounting a motor, and exactly where it would be is a chassis cross brace. Something was not quite right here, and further ‘digging’ was required. On his return to Britain, Francillon went back to Marine Mountings at Swindon, living with his family at Spring Cottage in Bishopstone, a few miles to the east of the town. Having completed the chassis of his car, he needed a motor, so advertised in the 'Model Engineer' for a ‘petrol engine, Super Cyclone, Ohlsson etc in the .60 cu in to .604 cu in class’. Before he could make any further progress on the car though, he was off to India, where he served with the Royal Engineers for three years. 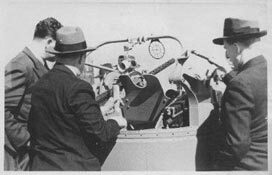 In the immediate post war period, there would be little call for gun turrets, which may be why Francillon considered manufacturing the model car kits. It also explains why the car was unfinished as this was how he had left it in 1943. What now becomes apparent is that the model illustrated in the magazine is Mr Francillon’s own car, built in 1943, which he admitted was to an American design with some American components. The production FRC however was to be entirely his own design, apart from the Dooling axles that is, which were replaced by very similar items produced by Francillon. These were illustrated in the Model Car Manual, but not until 1949 and credited to F.W. Francillon of Swindon. They differ from the Dooling originals only marginally. The rear axle has the gearcase open at the top rather than the bottom and is slightly larger, while the front half axles have a cast in lug for the rudimentary roll control. On his original car, this is just a piece of rod running in holes in each axle. The body was to be simplified considerably with the lovely long tailed version shown replaced by a much more stubby and simple aluminium one with the scuttle and bonnet in one piece, probably from pressed aluminium sheet, rather than a casting. 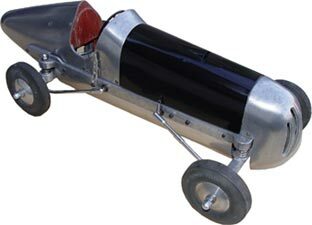 All that survived of the original body was the radiator cowl. 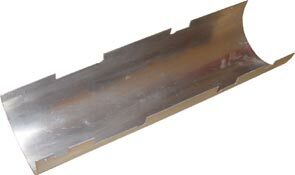 Because of the underslung axles, a rolled aluminium belly pan as was common on most of the American cars of the period was required to fill in the underside of the chassis. Slightly incongruous are the tyres, which were 4.5" dia Dunlop Trakgrip and on the face of it, most unsuitable for the rigours of tethered car racing. These were probably all he had to hand as he could not use the Dooling originals. The car is something of a monster at over 24 inches long and weighing 7lbs without engine or electrical gear. 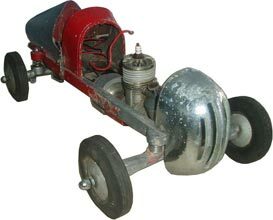 In 1947, the kit as shown would cost £7-19s-6d or £4-2s-6d without the body, There then is the ‘FRC’, announced in Model Cars, yet without a mention at all as far as can be traced in the other dedicated magazine Model Car News. With no information to the contrary, it is a reasonable assumption that the initials FRC were an abbreviation of Francillon Racing Car. Strangely, there do not appear to be any adverts for the FRC or any of the usual companies offering it for sale until well into 1948. Hobbies Corner of 10 Rodbourne Road in Swindon then placed an advert in Model Cars stating that they were- ‘agents and stockists of F.R.C Miniatures’. It further mentioned that Hobbies Corner were ‘official stockist for the North Wiltshire Model Car Club’. The final ad in Model Cars featuring the FRC was in September 1948, when the price had risen to £9-10-0, less clutch. It would seem that the only avenue to getting one of the cars was via the address at 124, Victoria Road, Swindon. This is where it all starts to get a bit confusing as this address in 1947 was occupied by Ross Toys and Fancy Goods, becoming Harton’s Sports Toys and games in 1948, and a chemists in 1949. Of course, it could be where the Francillon family were living at the time, as his daughter remembers them moving about, as housing was hard to come by in the immediate post-war period? The North Wilts Model Car Club and Mr Francillon seemed to have some direct connection with Steel’s Garage in Drove Road Swindon as the Club had a secure track situated next to the garage. Also, Francillon as Secretary had given his name and the garage’s address as the contact point for the Car Club. The ‘On The Track’ article in the December edition of Model Cars in 1948 featured the North Wilts Club. Photos show the member’s cars lined up, including three production FRCs, the members with their cars in which Francillon and his daughter can be identified and then a pit scene, again with Miss Francillon clearly in evidence. The Club does not appear to have affiliated to the Model Car Association until much later and all mention of the FRC seems to vanish until Hobbies Corner started advertising in Model Car News in April 1949. The advert ran for two months and then stopped again, which seems to coincide with the Club loosing the use of their track through subsidence. There seems to be no further mention of FRC Miniatures in any Journal. 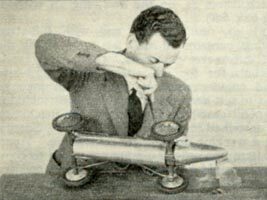 A somewhat critical note appeared in the November issue of Model Car News in 1949 indicating that the lack of running activity and lack of cars had resulted in ‘interest and membership suffering’. A further note in December stated that Mr Francillon was no longer Secretary of the Club. Left: Pits scene with Miss Francillon and FRC car in foreground. Dooling Mercury behind. 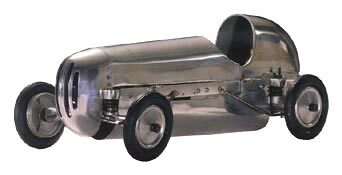 Francis Francillon was still active in tethered car racing though, but he seems to have abandoned the FRC in favour of a much more competitive design based on a sheet aluminium pan and body. Whether this was of his own design and manufacture or a commercially available car has been impossible to ascertain. From his comments that ‘it takes around 18 months spare time to build a complete model, including engine’, and that ‘one has to be an expert at panel beating’, then it is reasonable to assume that he had built his own car. The car recorded speeds of 100mph, but these do not seem to have been at official meetings, so no records of Francillon’s racing exploits have so far been found. The only mention of him in competition was from his newspaper interview where it stated that on of his models finished fourth in an open speed contest at Bath at 81.18mph, featuring in a BBC recording of the event. Right: Francillon working on his competition car. 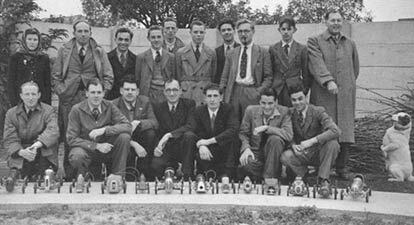 It is most likely that FRC Miniatures as such foundered almost as soon as it had started, given the pace of development in tethered cars during the late 1940s. The design, with cast chassis and underslung axles was already outdated before it was put into production and there was also intense competition amongst the numerous other manufacturers that had set up during the same period. 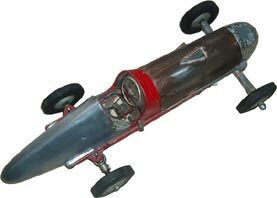 It is estimated that no more than twelve FRC cars were ever produced, with most probably being sold to club members from Swindon, Bath and Bristol. As far as is known, only one production example has survived, which was fitted with wheels and tyres from a direct competitor, E&M of Coventry. Mr Francillon continued racing into the early 50s, when the North Wilts Club seemed likely to lose its track again. Tethered car racing was in steep decline and most of the established companies providing cars and components had closed down as the market contracted. 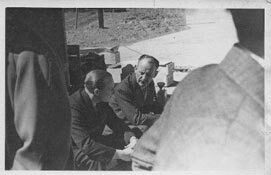 By this time Francillon was working as an engineering inspector for Plesseys at Wroughton, where Marine Mountings had also built their new factory. The family had moved around 1948 and were living at Eastdown Drive, Upper Stratton. His daughter recalls that this was the first house they had where they were not sharing with another family, the move prompted by her grandmother insisting that it was time she had a room of her own. The family had moved from there from Blunsdon, just to the North of Swindon, which was a venue for motorcycle races that they used to attend regularly. The decline in tethered car racing coincided with major changes for the Francillon family. Jeanne had met an American serviceman stationed in the UK, marrying him in October 1952, just before his discharge. They took housing here for a brief while before moving to the States and setting up home near Owensbro in Kentucky, raising six children. In August 1953, Francillon and his wife flew out from London to New York to join their daughter and son-in-law and start a new life in the USA. The hottest summer for many years did not suit Mrs Francillon who always said that if she had the money she would have returned to England. Francis Francillon did not pursue his interest in tethered cars in the States, preferring full sized boats as he lived near a large lake and the Ohio River. He worked as a trouble-shooter in a local factory until his retirement, continuing to live at his home in Maceo, Kentucky until his death in 1988. Mrs Francillon died in 2008 at the grand age of 95. Happily, Cindy, the wife of one of Francillon’s grandchildren who lives in Indiana saw an appeal for information and made contact, which is what has made much of this article possible. That brings us back to the car that had been discovered. There can be little doubt that it is Francillon’s original 1943 car that became the prototype for the FRC. The photos in 'Model Cars' confirm that it was still unfinished in 1947 with the attendant design problems evident. Given the date of the Hallam motor fitted, it was probably completed shortly after this, although with a slightly ‘agricultural’ approach. The problem with the chassis cross brace seems to have been resolved by the simple expedient of sawing it out. Mounting the motor was more difficult and a distinctly non-engineering solution adopted with two bent aluminium brackets bolted to the chassis. These were complicated by being attached to the inside of the frames where there was a pronounced angle created by ‘casting draw’ on the patterns, hence they were roughly bent to accommodate this. 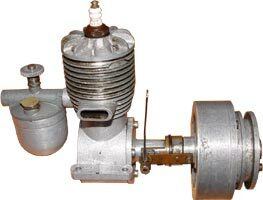 The Hallam motor was fitted with an aluminium flywheel that incorporated a starting ring with a dog clutch arrangement to disengage it. 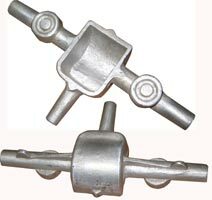 With the drive shaft being at such an angle to the motor there is a flexible coupling as well as a ball joint and telescopic section to allow the rear suspension to work. Ignition coil and condenser were mounted on a piece of Paxolin board that can only be removed if the bodywork is taken off, which is a major job in itself. 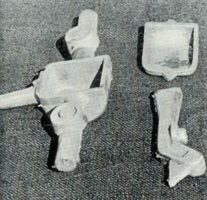 Although there are screw holes in the chassis, there is no evidence that a belly pan was ever fitted, and with the way the engine mounts were arranged it would be impossible to fit the one as shown in 'Model Cars'. The bonnet gained an air intake, but this was simply to give headroom for the sparking plug. What is not known is whether it was Francillon that finished the car or a fellow club member. At some stage, all the aluminium body sections were chrome plated and the chassis parts painted beige. What followed is purely conjecture, but it seems that the chrome flaked off over the years and relatively recently someone set about restoring the car, if that is the correct term? The screws that held the body onto the chassis were tighter than tight, so rather than remove them, red paint was applied everywhere that was visible. Some parts that were easily removed were re-chromed and the ignition wiring had gained some modern crimped fittings. The restoration was never completed however, so the car was sold with flaking chrome, partially disassembled, roughly painted, a bare and rusty metal bonnet and looking very sad and sorry. This though was where the whole story started. What then of the car? The owner remained in a dilemma as to the most appropriate way to deal with a possible restoration, while further research continued into its history. Circumstances then decided him to move out of tethered cars, eventually leading to the sale of his entire collection. The FRC was passed over to another member of the Retro Club in exactly the same condition it had been received, passing on the restoration dilemma as well. After a great deal of consideration something of a compromise was decided upon. The car was stripped down completely and carefully cleaned. All the old paint was removed, as were the remaining flakes of chrome. Rather than re-chroming, which would have looked rather garish, or polishing within an inch of its life, all the aluminium was left natural to reflect its age. The steel bonnet was sprayed black, as there was no evidence of any other colour. Re-assembly was something of an adventure as there was a heady mix of UN, BS, and BA thread sizes, but not enough nuts to go round, especially as each wheel required a domed nut and a plain lock nut. With a bit of re-threading, the job was almost done. 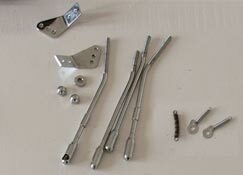 After a photo session of all the components parts a start was made on assembly. What became apparent was that with a pan fitted, there was a fairly definite order to be followed as was found out the hard way on more than one occasion. It was easy to see why the radius rods had not been refitted, as these required a considerable amount of realignment before they would slide through the axles at right angles and seemingly required rubber bushes to allow for suspension movement. The ignition wiring was sorted, with the right wires connecting the correct bits together, but revealing yet another mystery. There must have been a battery if the car was ever to have run, but there was no evidence that one had ever been fitted and no holder, compartment or anything else. One assumes that it was lodged in the tail somewhere. The Dooling tyres are in varying states of decay, but as they are 1940s originals they will stay on the car. In terms of restoration this was one of the easier, as the prime desire was to keep everything as close to original as possible. The only new parts are replacements for what was missing. Little did we realise when the car first came to light over three years ago that such a fascinating story would unfold. This is due entirely to a great deal of research, some happy coincidences and a lot of luck along the way. Thanks must go firstly to Gary Maslin and his philanthropic gesture that ensured the future of the car and that its story would be told. It was his very bold punt in buying the car that set this whole exercise in motion originally. It also ensured that the FRC and Francis Francillon are accorded their place in tethered car history. Gary was also responsible for much of the research local to Swindon. Thanks go to Peter Hill who provided the initial identification and gave access to the original photos of the North Wilts Club and to Geoff Sheppard of the Bristol Society for additional photographs. So much of the above however would have been little more than conjecture without the material, information and photographs provided by Francillon’s daughter Jeanne and her son Tracey. We are indebted to them both for their help, and to Cindy Kelley for replying to the original enquiry that enabled it to happen.